11,431 others viewed this post. About a year ago I was featured by Canon for what I considered my first really successful nebula photo of this amazing region of space. Since then I’ve been learning and upgrading my tools with all the Southern Hemisphere winter objects and just waiting for another crack at Orion! I got my chance from about 1am – 4am last night as the weather finally let up and Orion rose above my house. This shot is stacked from about 1 hour exposure time total using the super-fast Hyperstar lens configuration on my Celestron Edge HD 9.25″ SCT, and the handy QHY12 One Shot Colour CCD Camera. I’ll definitely be adding more data to this later to draw out even more of the dust which really intrigues me. I love how it seems to drip out of the trapezium (the bright area) when framed this way, creating an unbroken bridge to the “Running Man” on the right, and the wispy cloud tendrils reaching outwards. 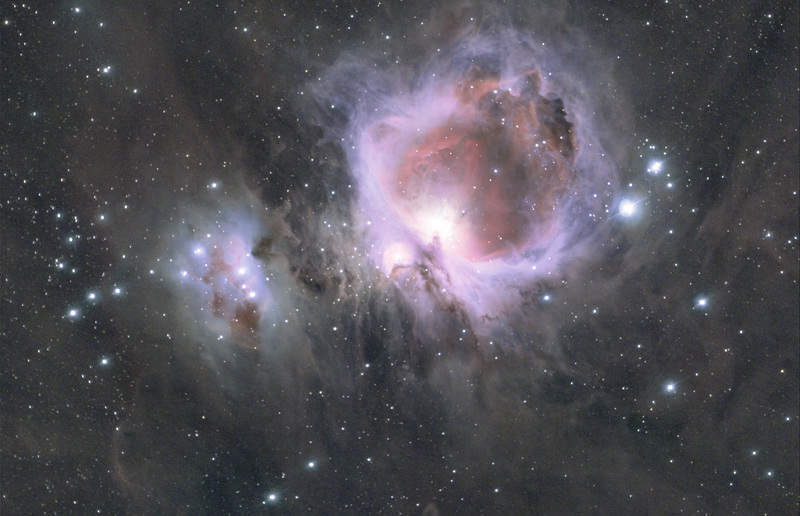 M42 is a much photographed object as its brightness and size makes it easy for beginners to observe or capture.